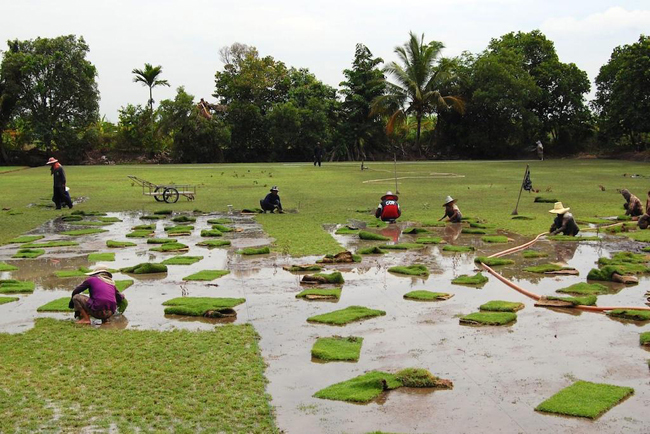 Zoysiagrass is especially well-adapted to East and Southeast Asia. 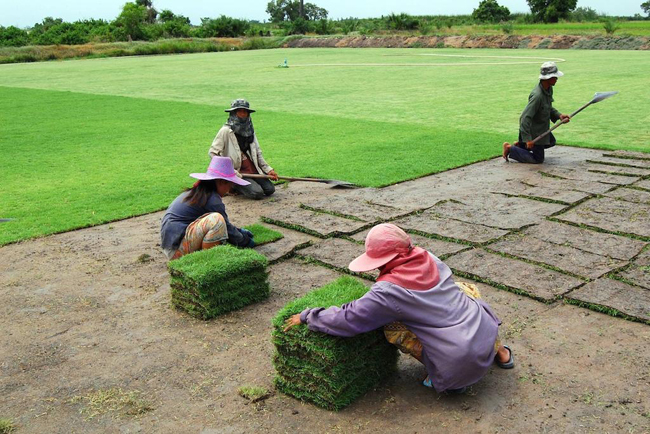 At Thailand, the local variety of zoysia grows so well that the time from planting to harvest is only 45 days. I wrote an article describing the process of zoysia production near Bangkok and this article has been published in the summer 2010 issue of the Hawaii Golf Course Superintendents Association newsletter. Dr. Micah Woods of the Asian Turfgrass Research Center? You have probably used a bit of Zoysia at some time, but I bet you have never seen it produced like this. In my work at Thailand, I have purchased Zoysia sod for my own use, and have consulted on projects that have purchased Zoysia sod, and have played on courses that have used Zoysia sod, and have heard about the production methods used, but it was not until last week that I actually saw for myself this labor intensive yet simple method of sod production. The time from planting to harvest is 45 days. Three fertilizer applications are made to produce one crop.Virtually no herbicides are used. Rotary mowers are used just a few times to trim the turf. And it is cut and harvested entirely with hand tools. Did I mention that the process is labor intensive? 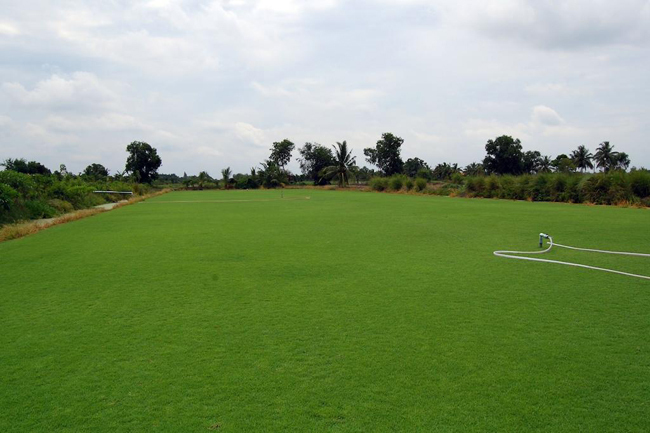 The primary Zoysia used in Thailand is a native Zoysia with characteristics close to Zoysia Matrella, having slightly softer and thinner leaves than a typical Zoysia Japonica type, and in Thailand this native Zoysia is called Nuwan Noi. 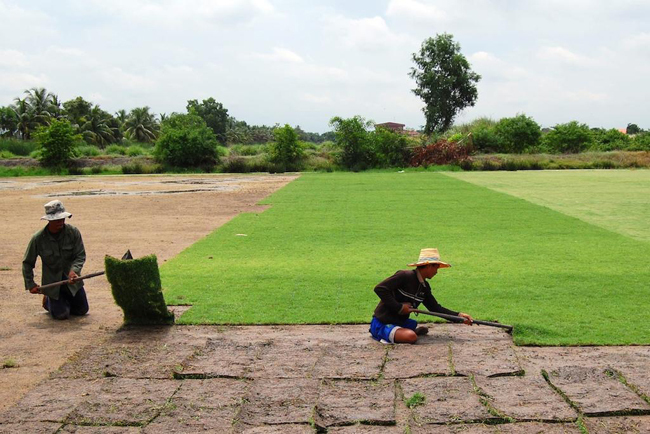 Zoysia sod is produced near Bangkok on fields formerly planted as rice paddies. The soil is a clay that compacts and water infiltrates very slowly into this soil. But that is actually what the sod producers want.The planting process begins on a field that has been harvested, so it is bare of grass. Sod pieces are placed at regular intervals across this field and some water is applied to the field to create a thin layer of water at the surface, and workers then break up the sod pieces and plant individual plants across the field, basically just laying the plants on the surface. 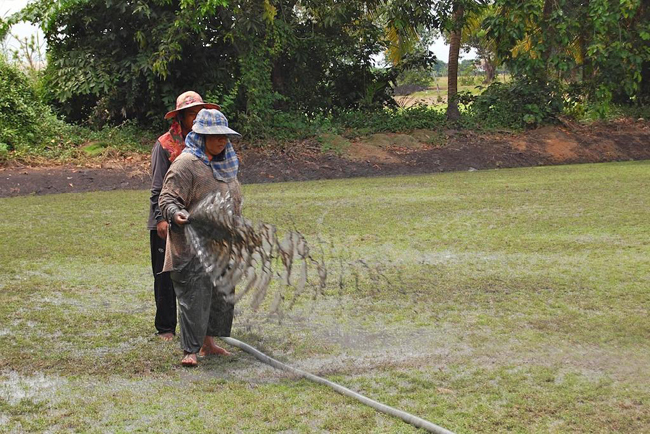 A propeller is used to stir up some mud in the irrigation canal, and then muddy water is pumped out and applied as a slurry over the top of the newly-planted Zoysia plants to create a water-holding and nutrient-rich environment around the crowns and stolons of the plants. After this, water is applied as needed, weeds are manually removed, and three applications of fast-release fertilizers are applied, the first after planting, and the subsequent ones right after a crew of weeders has finished with the field. After 45 days, the grass will have formed a complete cover across the paddy soil but will not have grown much into the soil. There is a mat of stolons and stems and leaves sitting right at the surface. 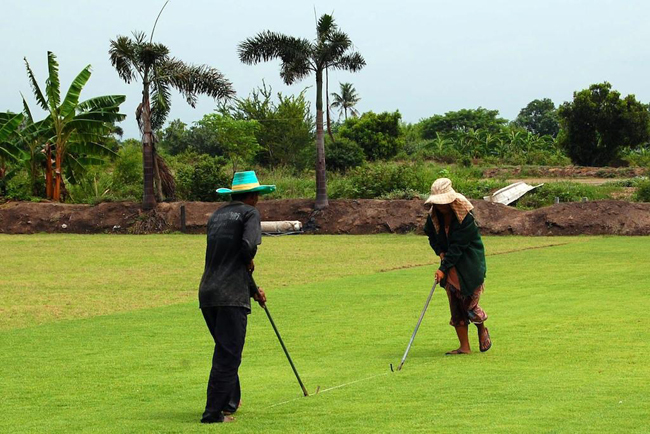 When the sod is ready for harvest, workers lay a string across the field and then using a simple tool with a handle and a penknife blade at the end, they cut the vertical lines into the turf, setting the size of each sod piece. Then, a crew of workers use another tool to separate each piece of sod from the soil, and the pieces just come right up without much soil attached and then ladies stack the sod pieces into piles and the sod is ready for sale. If it is going to a local market, the small amount of soil will be left on the sod. If it is for export, or to be planted on a sand rootzone, then the soil will usually be washed from the sod. Once the Zoysia is more than about 60 days old, it attaches itself more tightly to the soil, more of a puffy mat develops, and it does not produce a high quality turf for planting. But at about 45 days under this management, the sod is ideal for planting on golf courses or lawns or sports fields in Southeast Asia.